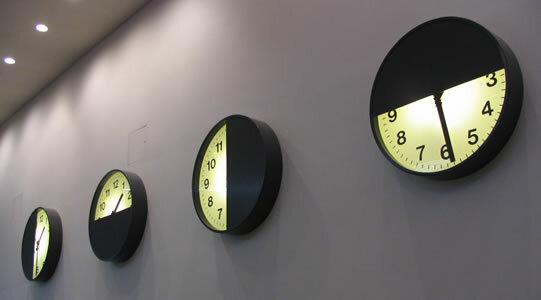 These clocks can be found in the Arts Centre at the University of Warwick. What was the time when I took this picture? If I hid one of the clocks would you still be able to tell the time? Would it make a difference which clock I covered? Would there be periods of the day when I could not work out the time if there were only three clocks and what would those periods be for different combinations of three clocks? Below are some pictures of just two of the clocks. What periods during the day would you not be sure of the time in each case? Games. Nets. Cubes & cuboids. Working systematically. Interactivities. Time. Mathematical reasoning & proof. Visualising. PrimaryGames-Strategy. Real world.